Click here for 3 full quotes from Bernie Sanders in the book Intro to Playing Bigger, by Bernie Sanders. This book is about community organizing; to a large extent, Bernie Sanders' presidential campaign is about community organizing too. Sanders wrote the introduction to the book because he is recognized as a national leader in this method (as was Barack Obama before him). Sanders summarizes, "Today, America is locked in a bitter struggle between organized people and organized money" (p. 1). "Organized money" means SuperPACs created by Citizens United; "organized people" means community organizing (more on that distinction in our review of FeelTheBern.org). Most Americans first heard the term "community organizer" when Barack Obama was accused of having that as his only qualification for the presidency in 2008. Yet Obama used his community organizing skills to win the Iowa caucus in 2008, and to parlay that caucus victory with more caucus victories into the Democratic nomination. As we detail in our book review of Outsider in the White House, Hillary Clinton actually won the majority of state primaries in 2008 (Clinton 20 states; Obama won 12), but Obama won nearly all the caucus states (Clinton won only 1; Obama won 17). Sanders inherits that organized community from Obama in 2016 -- the same progressives plus 8 years' worth of newcomers -- so what community organizing does Sanders hope for? Reporter: Have you made up your mind whether to support Bernie Sanders or Hillary Clinton in the caucus? Iowa voter: I'm not sure yet; I've only met each of them three times. In a presidential contest, meeting Bernie's supporters is good enough, that joke notwithstanding. That means Bernie's community organizers have to pound the pavement and make endless phone calls -- that is the "organized people" that Sanders refers to; TV advertising is much more about "organized money." The reason that community organizing works in caucuses is because there are byzantine rules to follow -- the community organizer's task is to inform people about how to go to the caucus and what to expect. Bernie persuades people by TV debates and TV commercials and so on; but the community organizers on the ground have to get the people to caucus. You must arrive at a particular time, even though the caucus takes an hour or so, and if you're late by one minute, the doors are locked so you can't get in to vote. The community organizer's role is to tell people to get there EARLY so they are not locked out by the party establishment doorkeepers. At one caucus, I snuck in a newcomer who arrived a few minutes late, since newcomers often do -- the trick is to find an unguarded door (or wait for the party establishment guard to leave) and pretend the person arrived on time. The community organizer's role is to get their people there early, and provide coffee and doughnuts to endure the wait. You must arrive at a particular place, which is not your normal voting place. It's often a church basement or a union hall -- not a publicly-known location like a school, where normal voting occurs. The community organizer's role is to tell people where to go, with directions, since the party establishment already knows the location, having been there in the past, while the newcomer outsiders do not. And of course if you get lost, you don't arrive on time, and you don't get to vote. I have attended caucuses where the party establishment gave out "incorrect" directions (intentionally, we believe), so that newcomers would get lost and arrive late -- community organizers provide their people with their own directions. You must arrive with sufficient evidence that you are a registered Democrat, and that you have registered some time in advance (in Massachusetts, the cutoff is 40 days in advance, just to make it a little harder!). I was challenged once at a caucus on my registration status -- but since I'm a community organizer, I didn't accept the party establishment rule that I get excluded -- I insisted that we march down to City Hall and inspect the records, which proved my registration status had been changed on time. In other words, the party establishment will often "lose" the registration records of newcomers, and it's the community organizer's role to confirm registration status in advance and provide proof on the spot. You must vote publicly -- there is no secret ballot at a caucus! Newcomers are often shocked by having to state their candidate of choice publicly to their neighbors, by voice (and usually loudly too -- a caucus is a noisy affair!). The community organizer's role is to tell their people what to expect, so no one is so shocked that they leave (which is what the party establishment wants!). The Massachusetts caucuses are typical -- the Iowa caucuses have SOME different rules, as does every state, but the basic rules are the same everywhere. And Massachusetts party officials are no more corrupt than in other states -- they believe they are doing the right thing, and fervently believe that the establishment candidate is the right person. They might be "sloppy" in applying the rules, like "losing" registration status or giving out "incorrect" directions -- but they do follow the rules. It is the community organizer's role to enforce the rules, on the spot, at every caucus, after guiding people through the byzantine rules to get to the caucus on time, at the right place, with the proper paperwork. It's not glamorous -- but THAT is how outsiders win caucuses! Crooks on Wall Street started Great Recession & got richer. America struggles between organized people & organized money. Real unemployment is 16%; official unemployment only 9%. 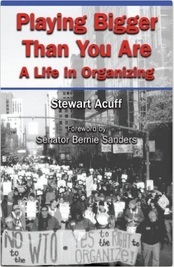 by Stewart Acuff (Introduction by Bernie Sanders).